How does Fashion, Art, Toys and Tattoos under one show sound? 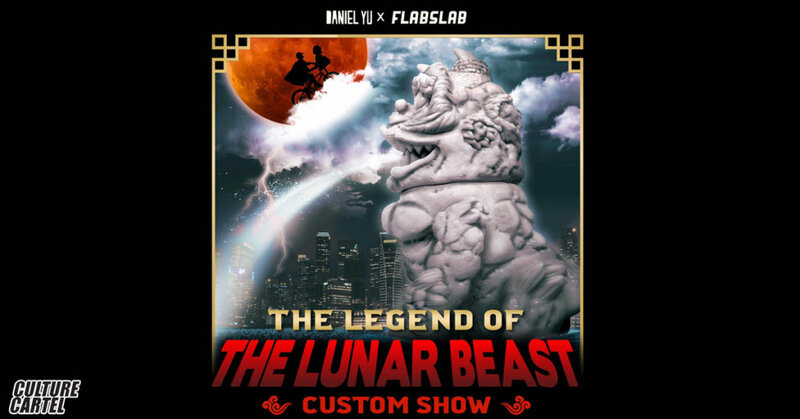 Daniel Yu x FLABSLAB ready to take on Asia’s first all-encompassing street culture convention next week and Daniel Yu & FLABSLAB have already started preparing for Culture Cartel by calling a host of artists from around the world to showcase at the event. Each artist taking on Daniel Yu’s Lunar Beast as a platform and giving their own signature spin on the Lunar Beast. FLABSLAB will also be releasing exclusive merch as well as the owner of FLABSLAB will be holding talks on the panel. Below is a Live Exclusive Preview stream of a few customs ready for the event. Culture Cartel, Asia’s first all-encompassing street culture convention, is set to unite the different sectors of art, toys, tattoo, and fashion in a consumer trade show that will showcase only the best of street culture in Asia and around the world. Co-organized by Habitual, Axis Group Asia and Division Communications, the event will take place from 1 – 2 December 2018 at Singapore’s F1 Pit Building, placing the limelight on the often-neglected segments of street culture. For the first time, these different elements of street culture will be brought together through various components of Culture Cartel 2018 – from brands and retail showcases to art exhibitions and installations. The inaugural convention serves as an international platform for street artists, designers, tattoo artists, and urban brands across the world to gather, and put together a holistic, educational and interactive street culture showcase that has never been seen before in Asia. Other highlights at the ticketed event include a forum that will host live talks and panel discussions about current topics in street culture, workshops for beatboxing and fashion customization, live performances in music and graffiti, public artworks from a global line-up of artists, a bike circuit and more. The curation of the exhibitions at the inaugural event is spearheaded by prominent industry leaders such as Invasion Studios by Jahan Loh (for Art), Jackson Aw of Mighty Jaxx (for Toys); Augustine Nezumi of Singapore Electric (for Tattoo); and Mandeep Chopra of Limited Edt (for Fashion), featuring convention headliners Stash (US), Joshua Vides (US), Jason Freeny (US), Whatshisname (UK), and Alex Face (TH), showcasing for the first time in Singapore. Exclusive Culture Cartel collaboration merchandise with brands like Subcrew, SBTG, Few & Far, CHPLCO, and New Era will be released, and there will also be exclusive launches of original and limited-edition merchandise. Powering Culture Cartel 2018 is Mercedes-Benz, with invaluable support from Belvedere (Official Spirit of Defiance), Zouk (Official Launch Party Venue), Papa Palheta (Official Coffee), HIC (Official Juice); Livepass (Official Ticketing Partner), Word of Mouth Communications (Official PR Partner) and Konstrukt Labs (Official Merchandise Partner). Get your tickets now at culturecartel.com.